One day on my way t o school I walked out of our apartment and discovered the second most beautiful car I had ever seen. 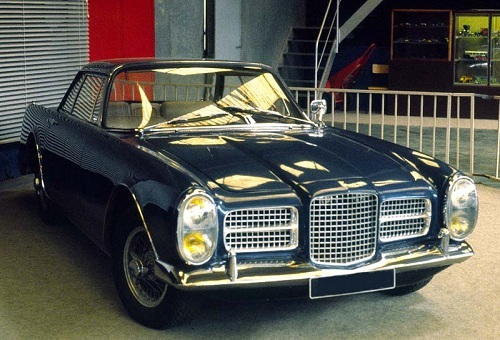 The Facel Vega II. It oozed elegance and wealth compared to the dinky Renault Dauphines and Seat 500s that dominated the streets of Madrid in 1963. I used to stand in front of it and walk around it for 5 minutes every day. I wondered what I would have to do to one day own one. I never found out who it belonged to, because one day it was no longer in that spot in front of our apartment. However I never forgot the feeling it evoked every time I saw it. I still think it looks regal and beautiful today. I later discovered it was even better than I originally gave it credit for, as I learned it was manufactured in France and carried a 6.3L Chrysler Typhoon V8 with 355 hp, and could outrun most of the 2 seaters on the period, including the Aston Martin DB4, the Ferrari GT250, and the MB 300SL gullwing. The last model, in ’64 (6.7L) was even faster could reach 150 mph with 4 wheel disk brakes and hydro-steer power steering. It was the best and most glamorous GT car of the times. It was very expensive, so only the richest and most famous people could own one. The list of owners was extensive, from Kings to movie stars to captains of industry. If you wanted the world to know you had arrived, you owned one.